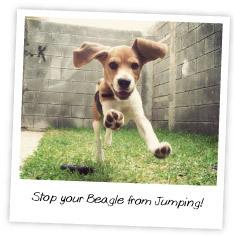 Want to learn how to stop your Beagle from jumping? A number of Beagle owners are rather worried because they find their pets either jumping on them, or on their visitors. This can be quite startling, especially during a get together, when one does not expect one’s clothes to be mussed up by a very excited little beagle. So how do you stop your beagle’s jumping? On couches and other furniture. You are going to be surprised to know that this is the easiest Beagle behavior, which can be solved very easily. Your Beagle is trying to get your attention by jumping on you. Also, it is showing its territorial instinct by jumping on a couch, which is considered to be its own possession. So the next time you see your Beagle running towards you, to jump on you in greeting or in enthusiastic welcome, just turn your back to it. It may feel a little bewildered, and is going to wonder why you have done that. It may move to you, face you, and try to jump on you again. Turn your back to it again. This is going to teach it that you do not like its jumping on you. You cannot try out this technique on heavy chairs. However, if you see your Beagle ready to jump on a lights chair, get there first. Pick the chair up and say “no!” firmly. Move the chair away. You will have to do this a number of times so that it understands that any furniture on which it jumps is going to be moved away. Beagles are very intelligent. However, any disciplining methods which are not consistent are going to confuse them. So continue this way of disciplining them, whenever you see it trying to jump on a couch, or on the chair. How Do I Stop Beagle Jumping On My Bed? Well, this is where you have to be very firm. If your Beagle has got into the bad habit of getting into your bed, ever since it was a puppy, it is going to be surprised if you suddenly decide that it had better sleep in its basket. A puppy jumping on your bed has to be put down firmly. Say “no” firmly. Make sure that your children do not encourage it to disobey your orders. Above all, never hit your dog while you are disciplining it. It is going to associate any discipline with pain. That is going to make it terrified of you. You can also use this method to stop it from jumping on you. If it shows intentions of jumping on you to greet you, move away, and ignore it. It is going to be a bit bewildered for a couple of seconds. If it still tries to jump on you, do not say anything and again move away. It is thus going to understand that you do not like or you do not accept this behavior. This is the easiest training method for preventing your Beagle from jumping on you or any other person visiting your house. Once your Beagle settles down and shows no sign of jumping, say “good boy,” and scratch it behind its ears. It is really easy to stop your Beagle from jumping! So try out these Beagle training techniques right now.